Carol’s Daughter products are known to smell heavenly but I only knew that from watching and reading reviews online. I recently got some of their products including this gem and MY WORD. Can I just say that when I first opened it and took a whiff, I had to look at the label again just to make sure I wasn’t supposed to eat it? And sure enough, there was a warning: For External use only. There are so many delightful and beneficial ingredients in this product; mainly Shea butter, cocoa butter and almond oil. There is also vanilla in it, and I don’t usually care for anything vanilla-scented but the combination of all this greatness makes this irresistible. Added to that, it is as super moisturizing as CD claims. They weren’t kidding when they added the “For Extra-Dry to Very-Dry skin” note. It is a great addition to my winter skincare regimen. My skin is always nicely softened without feeling heavy or staining my clothes. And it smells so good that I don’t even bother to put on perfume or body spray – it is that fragrant. 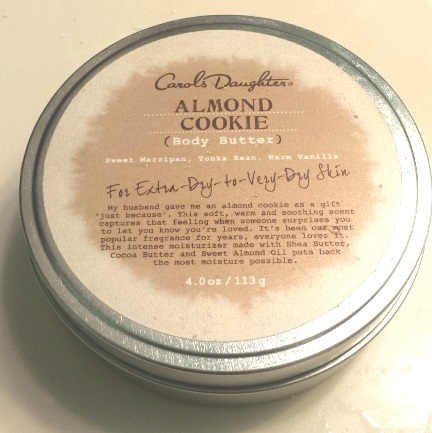 I perused their site and didn’t see the body butter among the Almond cookie line, so I’m not sure if it’s discontinued (say it ain’t so?) or only available in stores (enter: Canadian probz). I do see there’s a body spray which intrigues me! Anyway, I use it sparingly so I don’t finish it too quickly. It is only 4oz. This is a GET IT for me! I am about to say something and I would really appreciate it if you didn’t judge me…. Okay? I don’t care for chocolate. There, I said it. It gets a resounding “meh” from me. When I do eat it, I prefer white chocolate but 99.99% of the time I just skip right by it and head for the popcorn or chips. A friend gave Ash and me Godiva gift bags at our Blogiversary as a token of congratulations and, while I was touched, I admittedly internally “eep’d” because I didn’t want to seem ungrateful. The thought was so awesome of her! So when I opened the bag to not only see white chocolate, but white chocolate macaroons – which clearly means there is a high-probability coconut factor – I almost jumped out my seat with excitement. Wait a minute, I might actually enjoy this! But it didn’t end there. Oh no. I bit into it and my world changed. Forever. Nothing will ever be the same. Ever. And huge! I had to cut each one in half and make it into a 2-part snack. This would also work better because of course it is on the sweeter side. The only thing is because of the coconut, they had to be consumed within a matter of a few days. Well, twist my arm why dontcha, Godiva? I never finish chocolate anything before it expires. 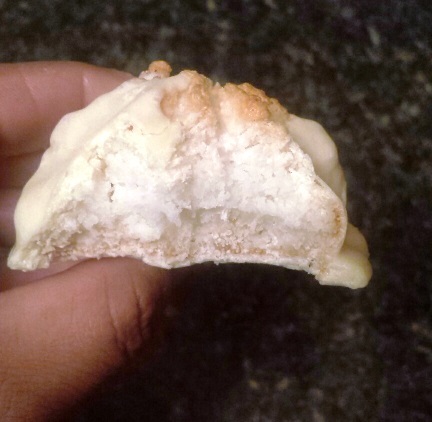 I usually give it away or itake a bite, shrug, then put the rest in my fridge… only to have to throw it out because it goes to waste (I hope you’re still reading this without judgment). But THIS???? No no. There was none of that. It was way too good. I didn’t even share, and I’m not embarrassed to say that! I’m not sure of cost, but if you love sweets and especially sweets containing coconut – this treat is for you. This gets a whopping GET IT. You’re welcome. Something you should know about me: I HATE holding things. NO really. I hate lugging around bags, cups or anything else. This explains my affinity for cross body bags and garments with pockets. I like to travel light (except when I am ACTUALLY travelling – but that is neither here nor there). Where am I going with this? Well, you see…I drink a lot of coffee and tea. And although I have countless travel mugs, I still find myself buying from Tim’s and Starbucks regularly. Why? Because I can’t be bothered carrying my travel mug to my destination. #firstworldproblems… I know. So I have been on the hunt for a leak-proof travel mug that doesn’t need to be held upright so that I can toss it into my purse and bring it along with me. When I saw the “100% Leak-proof” claim on the DAVIDsTEA travel mug I decided to give it a closer look. We don’t want to alarm anyone, but we think we’ve created the perfect travel mug. Don’t believe us? What if we told you that it’s completely leak-proof and double-walled, to keep your tea piping hot for hours on end. Or that it has a removable fine mesh infuser, plus a strainer to keep tea leaves out of every sip. Did we mention the easy-carry lid, or the hidden tea compartment? How about the big 16 oz. size? Yeah. We told you it was perfect. BPA free, designed in-house and made exclusively for DAVIDsTEA. So I picked up a black one for $29.50 and have been using it every day since. I have never, ever owned a travel mug this fantastic. It is indeed leak-proof, but that isn’t even the best thing about it. This thing is incredible at keeping my tea super hot. One morning I made tea at 8:30 am. I forgot the travel mug in my car until about 5pm. The mug was cold to the touch, we are talking subzero Toronto Winter chill deep freeze temps. However, when I went to drink the tea I literally burnt my mouth because it was still piping hot. It’s magic, I tell you. I will say, I gave up on the “hidden tea compartment” pretty quickly. It’s annoying to open it and hard to get the seal back on, especially when filled with tea leaves. It doesn’t take up any extra space because it is under the lid, so no great loss there. I really like the design of the mug which allows for loose leaf tea to be held in a strainer when I sip. I also really like the handle on the top of the mug for picking it up. DAVIDsTEA also offers a smaller mug with no handle for the same price. I don’t see why anyone would chose that one. 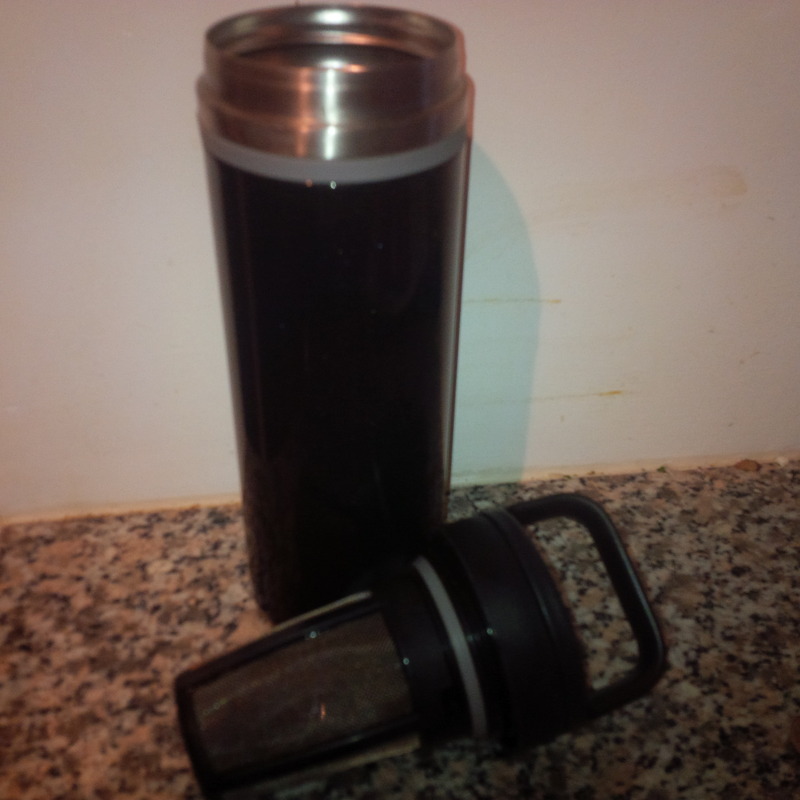 Sleek, leak-proof and incredible heat retention make the DAVIDsTEA travel mug a definite GET IT for me! Is it me, or had Two Faced really been stepping up their product game lately? My new two faced kick prompted me to give their newest primer a try. The name Hangover primer has always made me chuckle, but it makes perfect sense. Some mornings your skin is just over it and feels like it just partied it up a bit too much the night before, no? So this stuff is supposed to pump it back full of glow and such so that you look a little less un-dead in the face. Bueno. When long days of work and late nights of play give you a beauty hangover, this is your instant cure. Hangover is a revolutionary makeup primer infused with coconut water, probiotics and skin revivers that work together to boost skin’s radiance, promote elasticity and help hydrate while locking down makeup for fresher, longer and more flawless wear. We harnessed the science of hydration to create a creamy, penetrating primer that acts like an energy drink for the skin by replenishing moisture levels. It can be worn alone for a dewy, healthy looking finish or under bronzers, foundations and powders to create the perfect canvas. Coconut water and probiotics? Do I drink this stuff or put it on my face? I went with the latter. First thing I noticed about tis primer is that it is incredibly lightweight on the skin. I found it to be a refreshing change from slippery silicone based face primers. 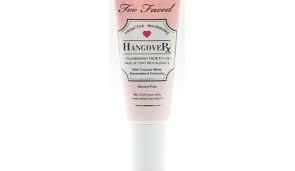 In fact, Hangover feels more like a very light moisturizer than I primer to me. My skin absorbs the product quickly and it seems to provide a bit of a sticky base for my makeup to adhere to. When applying foundation over the primer, the makeup applied well without streaking or caking, but I don’t usually have those issues if I moisturize first. I found that my makeup basically looked the same when applied and throughout the day with this primer underneath. I still had to apply my POREfessional primer as hangover did very little for visible pores. Given the nature of this product and the awesome ingredients that it is packed with, it could be that a month of use is not sufficient time to see results. But for now, I’m not blown away so at $32 for 1.35 oz. of primer, I am going to say FORGET IT. That travel mug will be my next 2 purchases – one for me and one for the boy – and then he will likely steal mine and I’ll have to go on a reconnaisance mission to his truck to retrieve it. Thank you so much for the tips and suggestions ladies! Well worth the money. My one tip is leave the water for a few minutes after boiling before pouring it in your cup. If you use boiling water it stays scalding hot ALL DAY! Amazing, but too hot for me to drink. 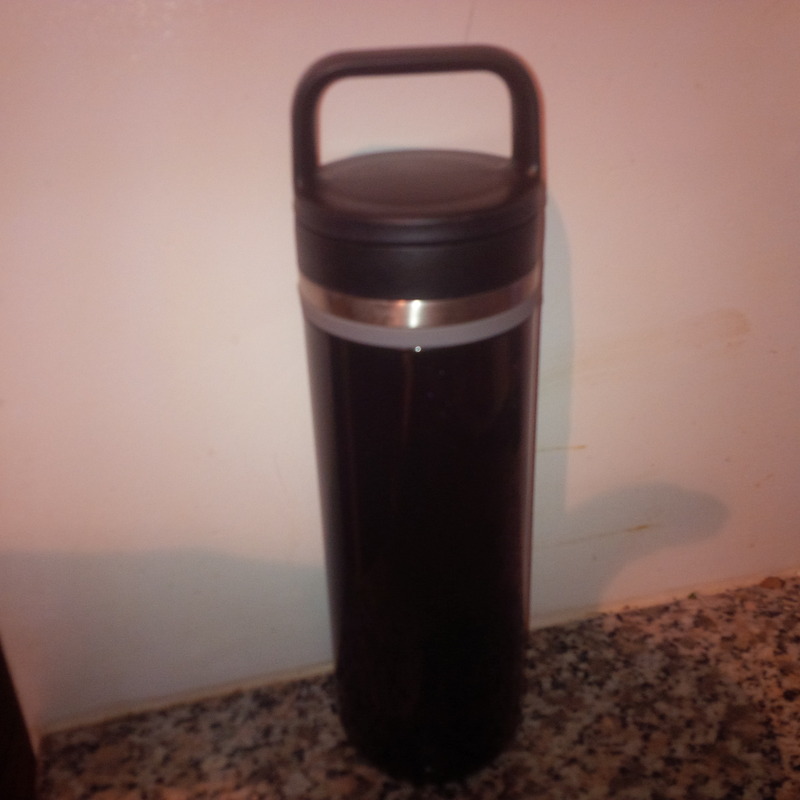 The travel mug is amazing! I Love it! I got mine in pink after your amazing review! Thank you TNL! Yay! Im so glad, isn’t it fantastic. I don’t know how I lived so long without it. Cheers to hot tea!